While the Chrysler Group showed off some early shots of the 2014 Jeep Cherokee a couple weeks back, a full complement of information has been offered up by the company on its newest SUV in conjunction with the start of the 2013 New York International Auto Show – including details on the two engine options and the new 9 speed automatic transmission. When the 2014 Jeep Cherokee debuted in pictures a few weeks back, the unique front end design became an instant hot topic among the car clubs and enthusiast community forums as diehard Jeep fans fussed about the new design that – honestly – is like nothing that we have ever seen on any American production vehicle let alone the famed Jeep Cherokee. The Cherokee is built loosely on an Alfa Romeo platform (which is shared with the new Dodge Dart) and when designing it, the Chrysler Group wanted to feature a design that had great aerodynamic properties with a look that would appeal on the global market all without losing that Jeep feel. What they came up with, specifically with the unusual split headlight design, has created some controversy in the Jeep world but shy of the new headlight layout this is a vehicle that very much fits in with the rest of the Jeep lineup. I suspect that had the 2014 Cherokee been fitted with a more traditional headlight design, many of the naysayers would have less to say but I also believe that this is a design that will grow on people once it hits the streets. What we did not get to see when the first images of the new Jeep Cherokee were unveiled earlier this month was the back end but with the full debut of the new SUV, we get a great look at the vehicle from all sides. From the side, the Cherokee has a shape that is very Jeep-like with a long cabin that extends nearly to the rear of the vehicle for better rear head room while the long hood and smooth angle at which it meets the windshield give it a very slippery look. Out back, the taillights are mounted higher on the back end than many smaller SUVs and while the design direction isn’t as extreme as the front end – the back end has a look that is unquestionably unique. This is likely another aspect that the “new Cherokee haters” will gripe about but as it the case with the front end, I applaud Jeep for going in such a bold direction with the exterior design. I don’t love it – but I like it and I think that it is a good step in the right direction for the brand. On the inside, the few images that have been issued of the 2014 Jeep Cherokee show a sporty, high tech interior that includes a similar thin film transistor (TFT) gauge cluster and the big, bright infotainment screen that is slowly making its way across all of the newer Chrysler Group vehicles. The 2014 Jeep Cherokee has been a major topic of discussion since debuting virtually a few weeks back due to its unique styling but today’s announcement offers the first bit of information on what will power this distinct new midsized sport utility vehicle. 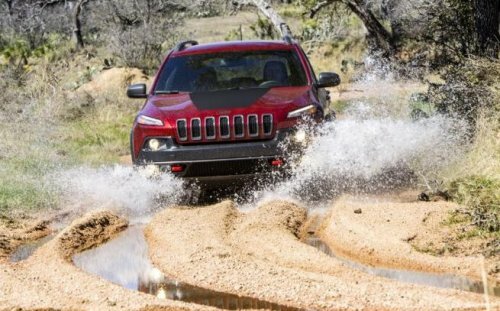 The key point of the 2014 Cherokee drivetrain options is the new ZF 9-speed automatic transmission, which is mated to both of the available engine options and is a segment first. This new gearbox should help the new Cherokee have good low end acceleration while still offering great fuel economy on the highway. As expected, the 2014 Cherokee will feature the new 3.2L Pentastar V6 which is the first derivative of the popular and award-winning 3.6L Pentastar V6 that is found in almost every vehicle that the Chrysler Group sells. This new 3.2L version will offer Cherokee drivers 271 horsepower and 239lb-ft of torque – enough to give the Cherokee best in class towing capabilities of 4,500 pounds. Chrysler also states that this new 3.2L V6 will be 30% more fuel efficient than the “outgoing” V6 but since the Cherokee is a new vehicle, there is really no previous vehicle with an outgoing engine. Provided that they are referring to the 3.7L V6 from the old Jeep Liberty, a 30% improvement would suggest that this new V6 could deliver somewhere in the area of 20 miles per gallon around town, 26.5 on the highway and a combined figure of 23mpg (based on EPA figures of the 2012 Liberty V6, 2WD model). The surprise of the engine lineup for the 2014 Jeep Cherokee is the 2.4L Tigershark 4-cylinder that offers 184 horsepower and 171lb-ft of torque. This entry level engine is expected to hit an estimated figure of 31 miles per gallon on the highway with a total driving range of 500 miles. In addition to the two engines and the new 9-speed automatic transmission, the 2014 Jeep Cherokee comes with three different all wheel drive systems (Active Drive I, Active Drive II and Active Drive Lock) as well as the new Selec-Terrain traction control system that includes five specially tuned modes – Auto, Snow, Sport, Sand/Mud and Rock. The 2014 Jeep Cherokee will come in four different trimlines when it hits dealerships later this year including Sport, Latitude, Limited and Trailhawk. The 2014 Cherokee Trailhawk is shown above on the right side in red and black while the chromed out blue SUV that we saw a few weeks back was wearing the Limited package. Front wheel drive is standard in the Sport, Latitude and Limited Cherokees while Active Drive I and Active Drive II are both optional. For the Trailhawk, the premium Active Drive Lock is standard. Click any of the thumbnails on this page for a closer look at the new 2014 Jeep Cherokee Trailhawk.